Rings are very saleable today and a wide range of rings can be found at our auctions each month. The most valuable rings being those that include good quality stones with age and style. A diamond three stone ring for example, can reach a high value when set with old-cut stones of high carat weight with good clarity and colour. The quality and age of a ring determines the value greatly. A platinum and diamond two stone cross over ring (FS18/294) that was sold in a jewellery auction held in our Exeter salerooms for £16,500. 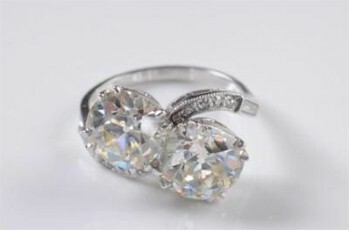 At auction, diamond rings can come in a range of single stone, three stone and eternity. The cut of a diamond ring for example, can impact the diamond's brilliance. If the diamond is cut poorly it will be less luminous and less valuable. The most popular diamond rings are those with round, brilliant-cut diamonds. Ruby, emerald and sapphire mounted rings can be found at our auctions, particularly those from the Victorian and Art Deco periods, as well as today's modern rings. 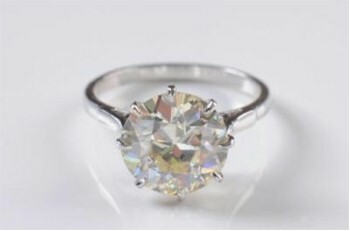 Another ring, this time a diamond, single-stone ring (FS18/293) that realised £8,000 when offered in a Bearnes Hampton & Littlewood jewellery auction. Mourning rings can reach high values at auction today. Mourning rings were worn in memory of someone who had died and often bear the name and date of death of the person. The stones of a mourning ring are often black, typically jet and were popular in Victorian times.